Found in maintenance shops and rail yards across North America , the Whiting Portable Electric Jack is the industry standard that continues to outlast the competition. 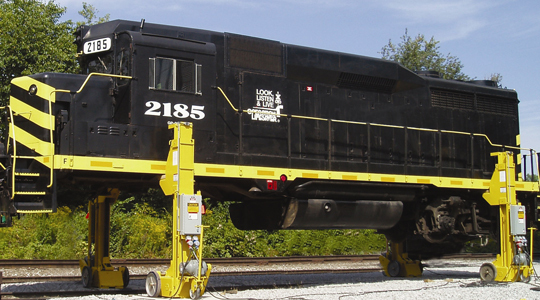 With minimal required maintenance, this rugged design handles the toughest conditions found in railcar and locomotive shops. All Whiting Jacks start with a welded steel base and structural steel column. Connected to this frame, the alloy steel jack screw is keyed to a worm gear supported by a large thrust bearing. The jack screw uses precision-machined buttress threads. 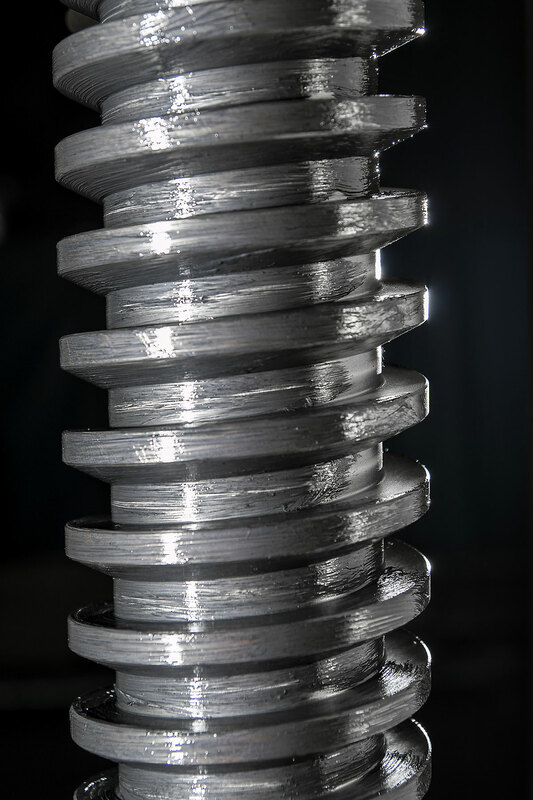 In this application, Buttress threads are more efficient and safer than other threads. The aluminum bronze nut travels on the screw and supports the welded steel lifting bracket. The result is a Portable Electric Jack with dependable load-lifting capacity at any point within the lifting range. Welded to the base is a massive structural steel column assembly housing an alloy steel jackscrew and aluminum bronze alloy jack nut. Whiting portable electric jacks consist of a steel base containing a worm and worm gear. The jack nut travels on the screw and supports the lifting bracket. A single operator manning a portable electric jack station can control the simultaneous operation of any number of jacks. Each jack may also be operated individually. Jacks can be equipped with a variety of special lifting brackets. From a Master Control Station Mounted to a Dedicated Jack, an Operator can Simultaneously Engage a Set of Jacks. Each Jack is Also Equipped with Starter and Push-Button Controls for Individual Jack Operation. Whiting is the only OEM parts supplier for Whiting Portable Electric Jacks. With a variety of standard parts for your jack in stock, Whiting Parts team members will work with you to get your jack quickly back in service. Whiting will also expedite parts as requested. Contact them today at (800) 861-5747. Whiting Services has technicians across the United States ready to inspect, maintain, and repair your Portable Electric Jacks. Our 20+ point inspection will give you peace of mind that your equipment is in a state of good repair. The report uses an easy-to-understand Pass/Fail system with images of potential deficiencies. For more information, contact your local Whiting Services branch or call (800) 336-7900. Whiting Jacks are designed to continue working well beyond the expected lifetime of the competition. A rebuild of the jack will extend the already long life with a one-year warranty on parts and labor. The customer will ship their jack to the Whiting factory or to one of the whiting Services branches. From there, technicians inspect and replace key components giving you a “Like New” Portable Jack. All for a percentage of the cost of a new Jack. For more information, contact your local Whiting Services branch or call (800) 336-7900. The addition of this feature will prevent a jack set from becoming unequally loaded or a vehicle tilted if any one of the jacks in the set stops due to a failure in the drive chain. If one jack screw stops, they will all stop and a red fault light on the relay panel will illuminate, identifying the malfunctioning jack. This fault will not allow the set to operate from the pendant station until the problem is corrected. The addition of this backup limit switch assembly provides a means for eliminating the danger of damage to a jack or a raised vehicle should the normal upper travel limit switch malfunction at the top of the lifting bracket’s allowable travel. The programming will allow the operator to lower the vehicle. Until the malfunctioning limit switch is repaired or replaced, the jack will not lift the vehicle. The addition of this dual purpose system allows the user to monitor unseen wear of jack nut threads, visually and electronically. It also prevents the loss of a load should the threads of a nut fail. An electronic sensing device is set to read the maximum allowable wear of a nut. Upon reaching this point, a signal commands the other jacks in the set to stop. A red light on the control panel will illuminate and shut down the system until repaired. The addition of this feature eliminates the problems of over and under greasing of jack screws and nuts. A small quantity of lubricant is directly injected onto the threads of the jack nut during operation and adds to the original thin coat application. The life of the remotely mounted and easily accessible cartridge depends on usage.